Is bad for SEO if browser need to run synchronous JS to get content? I'm developing a site using symfony + Vue. 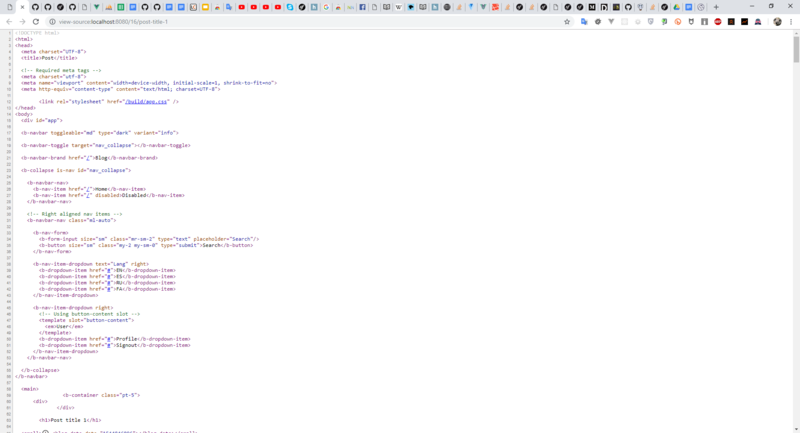 The problem is that this HTML with non-standard tags (components) gets into the browser. All that contained in the <div id="app"> element must process JS to get browser-friendly content with standard tags. These components would not exist if I used server rendering (SSR), but here I don’t understand a bit: during loading, my page already has all the content needed, no API calls are made to get the content like in SPA. Is it necessary to use server rendering in this case? Is it bad for SEO that before you get normal content, you need to execute JS code for this. Is feeding Googlebot and Bingbot crawlers with “special” data common thing in rich internet applications? Should my site be AJAX crawable? different content, same url, bad for SEO? Are clickable Category Badges good or bad for SEO? Affiliate links bad for SEO? Separate URLs on tabbed content - good or bad for SEO? “Satellite” articles = duplicate content = Bad for SEO?